My thanks to Jess over at Gone With the Words for bringing On the Island to my attention. I realize I'm likely the last person to the table here, but I literally had not heard anything about it before I ran across it on her list of books she liked way more than she thought she would. What a happy list, right? Then I sifted through the almost overwhelmingly positive reactions from my Goodreads peeps and decided this book I would normally have been firmly on the fence about might actually be a book very much for me. I don't generally go in for survival stories. And May-December relationships work for me even less often than survival stories do. A novel that combines both seemed doomed to DNF status. But. I had a feeling. One of those good ones. 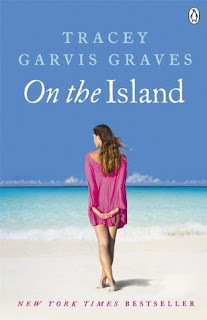 Originally self-published by Tracey Garvis Graves, On the Island was later picked up by Penguin. As far as the cover goes, I will simply say that I wish it reflected the harrowing nature of Anna's story a bit more. It wasn't what she wanted to do this summer. But it has to be better than sitting around at home making no forward progress at all. Which is exactly what she'd be doing if she stayed. Anna and her longtime boyfriend John have been rather pointedly not circling the issue of taking their relationship to the next level for years now, and Anna can't take it anymore. So she accepts the offer to tutor T.J. Callahan at his family's summer rental home in the Maldives. Seventeen-year-old T.J. is recovering from Hodgkin's lymphoma and is way behind in school. His parents set up this summer vacation to celebrate the remission of his cancer and to help him ease back into his former life again. And so the somewhat mutually reluctant Anna and T.J. board a plane to the Maldives to meet up with his parents and sisters who are already there. But when their pilot has a heart attack in mid-air, their plane goes down somewhere in the middle of the Indian Ocean. Injured and completely alone, the two of them manage to make it to a nearby island where they attempt to survive and somehow signal the searchers that must be out there looking for them. But as the days and weeks stretch on, it seems clear that any rescuers who might have been looking have given up by now. It shouldn't work. I mean, we all know what the inevitable is in such a situation, do we not? And it really shouldn't work. But somehow it just . . . does. Graves' writing is very straightforward and unadorned. Yet somehow that lack of pretension perfectly suits the starkness of Anna and T.J.'s situation. In fact, I thought the whole stranded on a desert island scenario was handled remarkably well. I had no trouble at all sinking into the monotony (and occasional terror) of their days. Both rather pragmatic, they develop into a strong team as they learn to do what they have to to survive, including everything from climbing trees to knock down unidentifiable fruit to dealing with injuries and building shelter. I confess, I drank it in. Nothing about their story feels rushed. And, as the years pass, it almost takes you by surprise how protective and fond of these characters you become. I appreciated the consistency with which Ms. Graves drew Anna and T.J. Perhaps most relieving of all is that they remain their ages. There is no romantic blurring of the lines between a thirty-year-old woman and a teenage boy on the cusp of manhood. The issue is always there throughout the entire book. And while the extremity and desperation of the circumstances do force their hands to a degree, that consistency and unrushed approach pays off in a big way when the inevitable eventually does happen. And that payoff sees you (and them) through the remainder of their story, which includes the unimaginable return to their lives that were and all the resistance and post-traumatic strain that entails. I didn't expect to harbor the feelings I do for this book. It has its flaws, to be sure. But I read it through in one sitting. The sweetness and openness that form its backbone are infectious, and I in no way regret the little piece of my heart it stole. Babbling About Books, and More - "I got the warm fuzzies and I’m not ashamed to admit, I had to blink back a few tears when I finished reading." Dear Author - "I read this in one sitting and enjoyed it, but looking back on it, I feel vaguely dissatisfied." Gone with the Words - "It will most certainly steal your heart." Ivy Book Bindings - "It was all achingly real and the age gap between these two made this novel one that readers of varied ages will be able to relate to on a very personal level." Smexy Books - "This book ended up being so warm and engaging." This book took me by surprise as well. I'm glad you enjoyed it! I agree with you about the cover- it looks like the heroine is on holiday rather than stranded on the island. I went into the book with the same trepidation about the teacher/student relationship and island survival story, but I was also pleasantly surprised. Yeah, it's just a touch more carefree than I'd like it to be. She really did pull off the gradual development of a relationship that could have been so bad. I thoroughly enjoyed it. Wow. You're not the only one. I never heard of this book. So it channels Robinson Crusoe? I gotta read this! Yeah, I don't know how it slipped by me so completely, but it did. There is certainly something of the Crusoe about it, complete with harrowing moments. Their relationship is very sweet and made it hard to stop reading. It's such a cool book. It is, Juju. I'm so glad I found it. Better late than never! You're right, it does sound like the whole thing shouldn't work but good to know that the book surprised you. Will add this to my wishlist! Right? But I can see where people were coming from. It's sort of unputdownable. I've been waiting for this review since you mentioned On the Island at the Stephanie Perkins thing. And now I'm convinced. Not that I wasn't from your earlier description, but now I'm actually *committed* as well as convinced. Lol. I approve of this new-found commitment. I don't get this cover at all. It looks like it belongs on a book about a girl who gets divorced and finds herself (and new love) on holiday in the BVI. And what's up with that mix of italics and roman on the title? Baffling. But I did like the book. The more I look at it, the more I shake my head. Going in, I had no idea if it reflected the tone at all. But looking back, like you say--baffling. I'm happy to know you liked it, too. Did you read it closer to when it first came out? I did. I read it back when everyone was first talking about it and it was self published. I had written a "stranded on an island" proposal a long time ago that never went anywhere, and so I was really curious to see what this one was like. The answer is "very different" btw. You had?? Tell me more . . .
LOL. I bet it was.